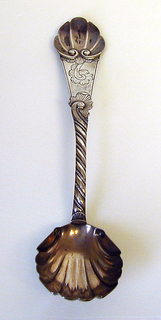 The spoon with shell form bowl. 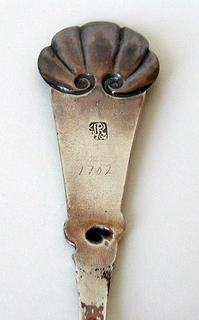 The tapering lower stem stamped with spralling diagonal rope twist culminating in a ruffle-topped scroll at mid-stem. The flaring terminal engraved with a ruffle-enhanced scroll and topped with a bold stamped shell.